When Justice John Paul Stevens retired from the Supreme Court of the United States in 2010, he left a legacy of service unequaled in the history of the Court. During his thirty-four-year tenure, Justice Stevens was a prolific writer, authoring in total more than 1000 opinions. 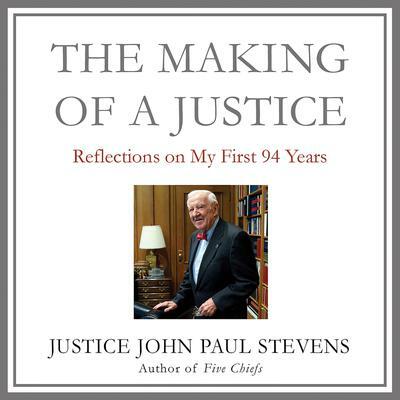 In THE MAKING OF A JUSTICE, John Paul Stevens recounts the first ninety-four years of his extraordinary life, offering an intimate and illuminating account of his service on the nation's highest court. Appointed by President Gerald Ford and eventually retiring during President Obama's first term, Justice Stevens has been witness to, and an integral part of, landmark changes in American society. With stories of growing up in Chicago, his work as a naval traffic analyst at Pearl Harbor during World War II, and his early days in private practice, as well as a behind-the-scenes look at some of the most important Supreme Court decisions over the last four decades, THE MAKING OF A JUSTICE offers a warm and fascinating account of Justice Stevens' unique and transformative American life.This comprehensive memoir is a must read for those trying to better understand our country and the Constitution.